1. 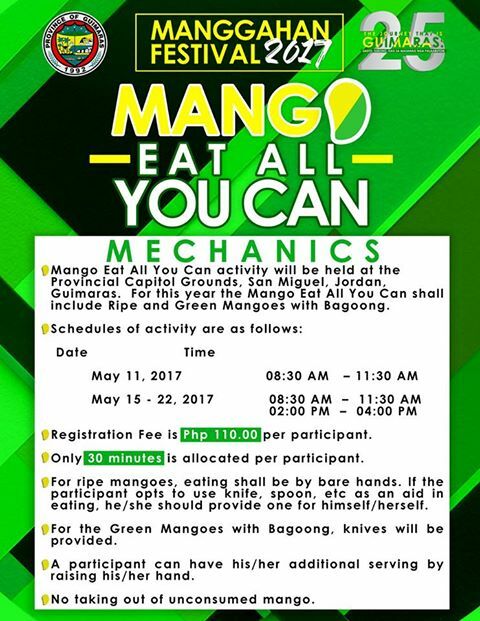 Mango Eat All You Can activity will be held at the Provincial Capitol Grounds, San Miguel, Jordan, Guimaras. For this year the Mango Eat All You Can shall include Ripe and Green Mangoes with Bagoong. 3. Registration Fee is PHP 110.00 per participant. 4. Only 30 MINUTES is allocated per participant. 5. For ripe mangoes, eating shall be by bare hands. If the participant opts to use knife, spoon, etc as an aid in eating, he/she should provide one for himself/herself. 6. For the Green Mangoes with Bagoong, knives will be provided. 7. A participant can have his/her additional serving by raising his/her hand. 8. No taking out of unconsumed mango.